Open 1-story 3/2 home boasting over 2,000 square feet. Feels new w/ modern updates throughout. White cabinets, granite counters w/ custom backsplash, breakfast bar & Stainless Steel appliances. Large living room w/ corner fireplace. Huge Master Bedroom & gorgeous updated master bath w/ walk-in shower, dual vanities w/ knee space & His & Hers closets. Vinyl Plank & newer Carpet throughout. All updated fixtures & hardware. Fenced backyard with patio. Convenient location, Northside ISD schools and no HOA. For more information, contact one of our REALTORS today! Open 1-story 3/2 home boasting over 2,000 square feet. Feels new w/ modern updates throughout. White cabinets, granite counters w/ custom backsplash, breakfast bar & Stainless Steel appliances. Large living room w/ corner fireplace. Huge Master Bedroom & gorgeous updated master bath w/ walk-in shower, dual vanities w/ knee space & His & Hers closets. Vinyl Plank & newer Carpet throughout. All updated fixtures & hardware. Fenced backyard with patio. 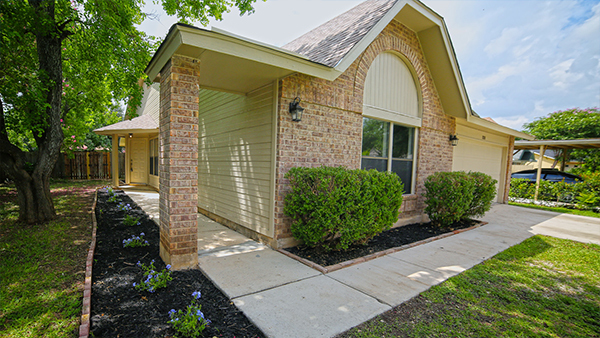 Convenient location, Northside ISD schools and no HOA.